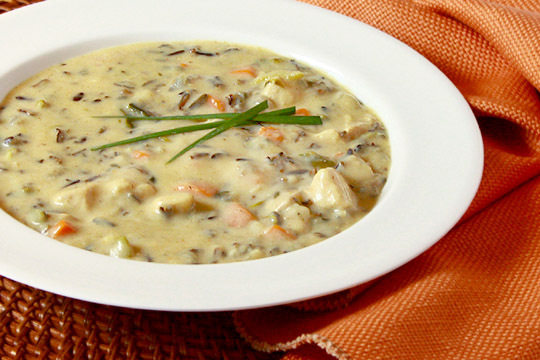 Here’s a terrific old family recipe for chicken chowder, passed down through my wife’s family. The only place I’ve seen it is on a stained recipe card. But it’s really good. 1. Place first 10 ingredients (chicken through ground pepper) in a soup pot; cover and bring to a boil, then simmer until the chicken is tender, (about 45 minutes). Strain broth, reserving vegetables, discarding the bay leaf, and picking the chicken off the bones. Discard bones. 2. Mix broth and milk. In a saucepan, melt butter; add mushrooms and chives and sauté until soft, 3-5 minutes; add flour and blend. Gradually stir in broth, continuing to stir until the soup thickens. Add salt and thyme, corn, chicken, and reserved vegetables. 3. Simmer 10 minutes longer; then serve in heavy bowls, topped with cheddar cheese. Posted on October 7, 2012, in Uncategorized. Bookmark the permalink. 1 Comment.